A gorgeous smile can have a huge impact on your appearance and sense of self-confidence. There’s no reason to live with imperfect teeth! If you have gaps between your teeth, or teeth that are badly shaped, crooked or stained, applying dental veneers can be life changing. A dental veneer on top of your teeth can correct mistakes made by nature or the results of an injury, and can help you have a fantastic smile. Little or no anesthesia is needed. Dental veneers are created by a dental technician, usually in a dental lab, using a model provided by your dentist. You need to know that veneers are usually irreversible because it`s necessary to remove a small amount of enamel from your teeth to accommodate the shell. So it is important that your dentist discuss with you any alternatives that provide the same results, but with minimal to no removal of tooth structure. Also, It is important that your dentist understands your objectives when undergoing a veneer procedure. You most likely will need three dentist visits – one for a consultation and two to create and bond the veneers. Your first appointment, the consultation, will include the diagnostic and examination phase of dental veneer treatment. This is essential and identifies any oral health concerns that must first be addressed before veneer placement. You and your dentist will work together to select the best tooth color for you from a special shade chart. 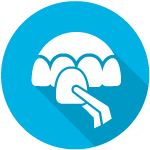 Special imaging technologies can provide you with a preview of your expected results. We will provide before and after images that can allow you to view the wonderful results of our happy patients. We can start treatment when the examination is completed and your customized plan is designed. Your next visit will be for tooth preparation. It may last one to two hours. Your natural tooth is prepared by minimally reshaping it to provide the best fit. However, after your teeth are reshaped, they may be sensitive to hot and cold due to the loss of enamel during this procedure. Increased sensitivity may also occur if you have temporaries placed, and for a brief time following placement of the final veneers. To prepare a tooth for a veneer, approximately .5mm of enamel will be removed from the tooth surface by your dentist. This is an amount nearly equal to the thickness of the veneer to be added later as a veneer to the tooth surface. Before trimming off the enamel, you and your dentist will decide the need for a local anesthetic to numb the area. Next, your dentist will make a model or impression of your tooth. This model is sent out to a dental laboratory, which in turn constructs your veneer. It usually takes 1 to 2 weeks for your dentist to receive the veneers back from the laboratory. Temporary dental veneers may be placed for very unsightly teeth – for an additional cost. However, temporary veneers may not always be placed. If enough enamel remains on the surface of your tooth, your dentist may forgo the temporary process. Be sure to discuss temporaries with your dentist during your initial consultation and examination. Temporaries offer a preview of the expected look, feel and fit of the veneer. During the veneer placement appointment, your dentist will remove the temporary veneers and affix your final ones. Your dentist will temporarily place it on your tooth to examine its fit and color before the dental veneer is permanently attached to your tooth. He or she will repeatedly remove and trim the veneer as needed to achieve the proper fit. Also the veneer color can be adjusted with the shade of cement that will be used. Next, to prepare your tooth to receive the veneer, your tooth will be cleaned, polished, and etched — which roughens the tooth to allow for a strong bonding process. 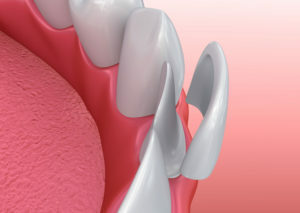 A special cement is applied to the veneer and it is then placed on your tooth. Once properly positioned, your dentist will apply a special light beam to the dental veneer, which activates chemicals in the cement, causing it to harden or cure very quickly. The final steps involve removing any excess cement, evaluating your bite and making any final adjustments in the veneer as necessary. In order to check how your gums are responding to the presence of your veneer and to once again examine the veneer’s placement, your dentist may ask you to return for a follow-up visit in a couple of weeks. When dentists use CAD/CAM technology in their office to produce veneers, your restorations will be created, bonded and affixed to your teeth in one visit. This procedure is often marketed by dentists as “same day dentistry” and does not require temporaries. Veneers are durable and have been shown to last for many years before requiring replacement. 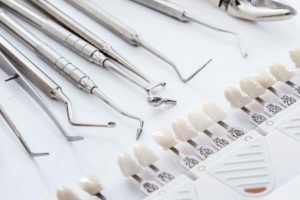 Seeing your dentist and hygienist for regular examinations and dental cleanings is important for maintaining the health of your mouth and longevity of your veneers. However, like other porcelain restorations, chipping and fractures may occur. Chipped or fractured porcelain veneers cannot be repaired, so your dentist will advise you of the costs and added time associated with replacing a damaged restoration. Be careful with your new veneers! Do not bite or chew on hard objects such as nut shells or bones, and do not use your teeth to open or tear packages. Be sure to use a non-abrasive toothpaste and brush and floss your teeth as you normally would. Even though the risk of staining the veneers with food or drink after the procedure is complete is greatly reduced, brushing after drinking red wine, coffee, tea or soda is advisable. Your dentist may even recommend that you avoid coffee, tea or red wine. One way to achieve a show-stopping smile is with dental veneers. Veneers are a great option for correcting almost any imperfection in your teeth. Let our office show you the amazing transformations others have gotten with this type of smile design. Please feel free to call us and we would be delighted to answer any questions you may have about dental veneers. By working closely with our patients, we’re able to create dazzling smile makeovers.